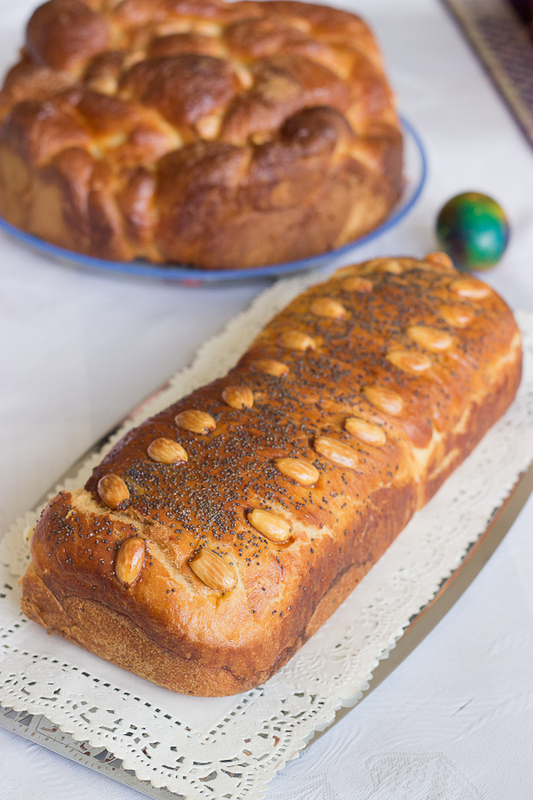 For the past few years I’ve been making Easter Bread which in Bulgaria is called Kozunak. 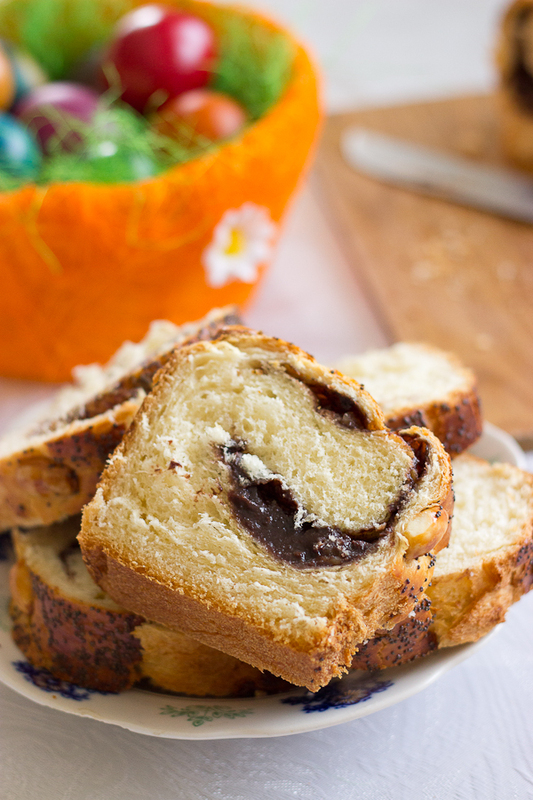 It is a very rich and fragrant bread with a lot of milk, eggs and butter. The fillings and toppings are endless. You can put whatever suits your taste, as the most common ones additions are walnuts, raisins, chocolate, frequently lokum (Turkish delight). Usually the topping is sugar, poppy seed and nuts- almonds, walnuts, and my grandmother uses apricot kernels. The shape is also optional, it can be simple like bread, or you can braid it in different manners. 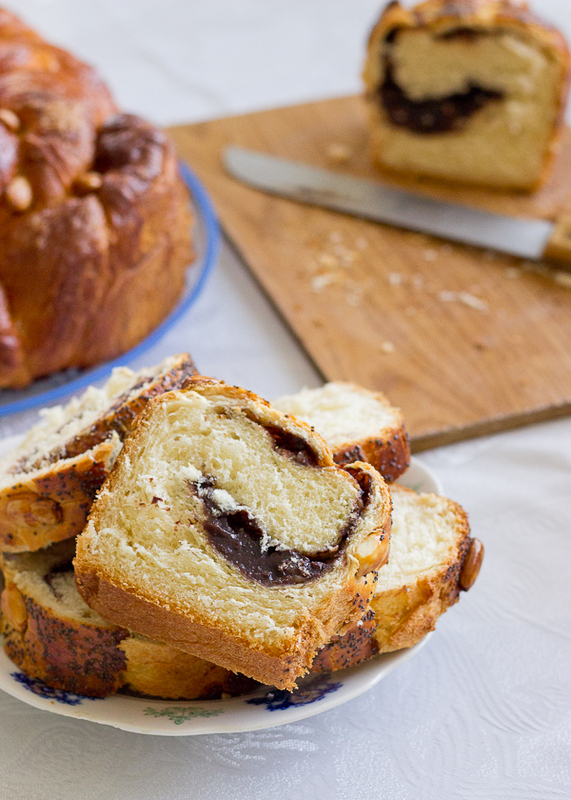 Traditionally the dough can be formed as a roll and filled with jam or chocolate. The Kozunak should be baked on Great Friday or Great Saturday, and there is always a lot of kneading involved, in order to develop the gluten and achieve the traditional texture. It should be soft, and there should be strings formed on the inside. Making Kozunak in not a walk in the park and it could be very tiresome. 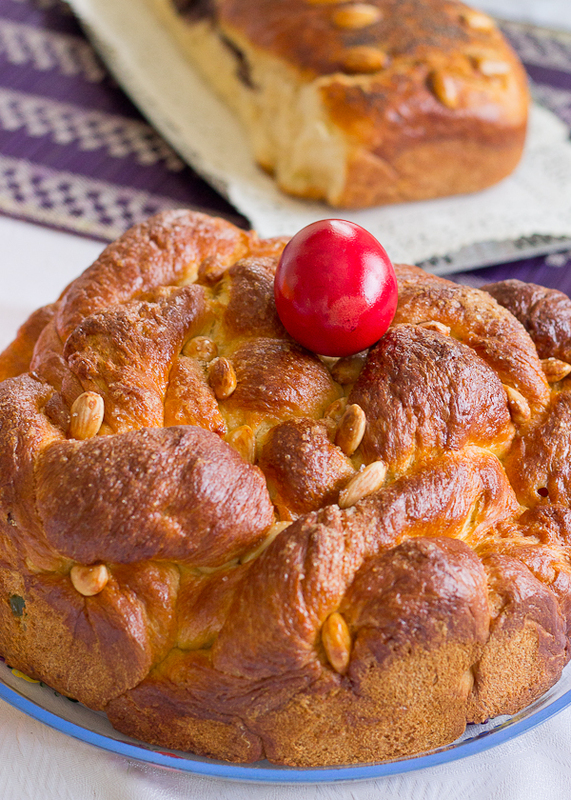 You will definitely need a lot of stamina, but it is made only for Easter and the bread is very tasty and oh, so aromatic. I proudly present to you the Kozunak! At least 2 hours before you begin you must leave all the ingredients at room temperature. The temperature is vital for this recipe as the Kozunak can be very capricious. First you need to activate the yeast. Start by measuring ⅓ of the milk and warming it in the microwave on low for half a minute. You don’t need it to be hot, but just very gently warm. Pour the milk into a large bowl and add the yeast, 1 cup of sugar and 4 tablespoons of flour. Mix until the yeast and sugar are completely dissolved and all the ingredients are incorporated. Cover with a towel and let stand for 15 minutes. Meanwhile sift the flour and salt through a fine sieve 2 times. You need to do this to aerate the flour. I find it easier to sift the flour over a large piece of parchment paper, that way it is easy to transfer. Place the butter and lard in a heat-proof bowl and microwave on low setting and 30 seconds intervals until melted. Set aside to cool. In a very large bowl place the eggs, the remaining milk and sugar, the lemon juice and zest and the vanilla extract. Using a mixer on medium speed beat the mixture until everything is incorporated and the sugar is dissolved, 4-5 minutes. Add the yeast mixture, which at this point should be bubbly and active, to the egg mixture and mix with a spatula to incorporate. Set aside 2 cups of the dough and place the dough on your kneading surface. Form a large well. Gently pour the egg-yeast mixture into the center of the well and gradually start adding the flour from the sides, little by little, until all of the flour is incorporated. And know you start kneading. Knead the dough and gradually add more flour from the reserved two cups, one tablespoon at a time, until it no longer sticks to your fingers. When the dough is soft and pliable, and no longer sticky stop adding more flour. Knead for 10 minutes and bring the butter and lard mixture to the kneading surface. Dip your hands into the butter and knead the dough until all the fat is incorporated. You should knead quite vigorously. Repeat this procedure until all the fat is incorporated. You took me more than 1 hour to do this. After all this the dough kneads to rest and so do you. Butter a very large stainless steel bowl and place the dough in it. Cover with a towel and let rest and rise for at least 2 hours. The dough should double in size. After the dough has risen take it out of the dough and gently knead it on a floured surface. Divide the dough into 4 equal parts. At this moment you can add the fillings and additions that you like. 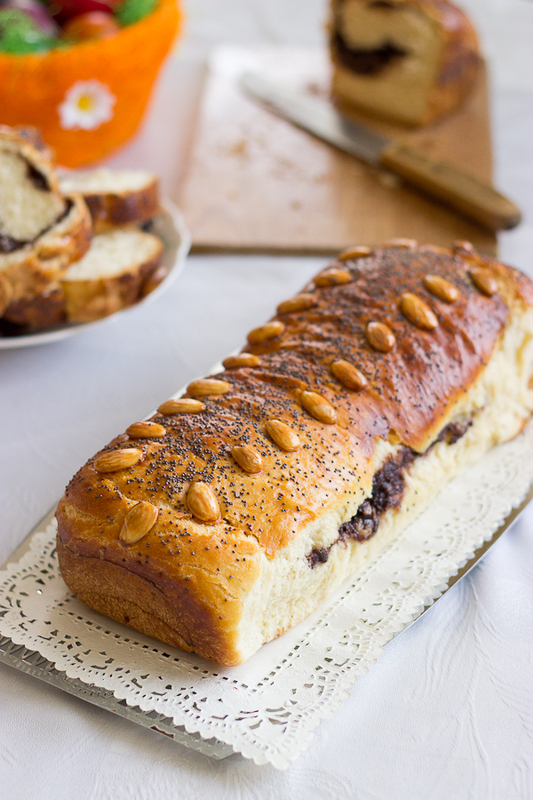 I made one large Kozinak, making 6 strand braid, filled with candied fruit and 3 rolls, filled with 1 cup jam+ 2 teaspoons of cocoa (heated until the boiling point) + 1 cup coarsely chopped walnuts. Place the Kozunak in buttered baking pans. I used a 26 cm. spring-form pan for the round Kozunak and a standard sheet pan to bake the three rolls, lined side by side. Cover loosely with greased plastic foil and let it rise again for 2 hours, or until doubled. Preheat your oven to 150 °C/300°F. Make egg wash from 1 egg and 1 tablespoon of milk and generously spread it on the surface of the risen Kozunak. Arrange the almonds on top and sprinkle with poppy seed. Bake for 50 minutes to an hour. Let cool completely and store at room temperature, tightly covered in plastic foil all around. Beautiful breads and quite tasty looking, both ways! It really is a great treat, though not the easiest one. Thank you for stopping by!